Or contact me if you would like to purchase directly. A few really cool items at the events this year. 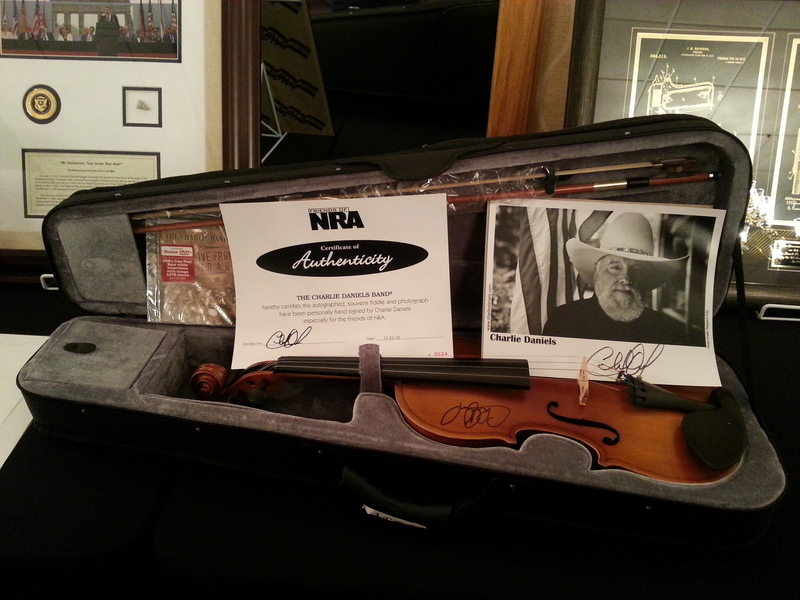 A fiddle autographed by Charlie Daniels. An NRA waffle iron. And yes, I hear we have some hard to find new bedangled shotgun or something. Along with many other firearms and collectibles. If you own a business, and would like information on sponsorship, underwriting, and letting people see your business supports the RTKBA. Please contact me. UPDATE: Reminder, there are less than 3 weeks until the Friends of NRA Dinner Banquet!!! The banquets are tons of fun, make for great date nights. Include food, raffles and games from which you can win guns and gear. If you’re a business, local or online, there are oppotunities to help sponsor the event either via under-writing or providing merchandise for raffles. We can even give your business or range and enclusive table with it’s own opportunity to win a firearm. See flyer for details. Even if you can’t make it to the White Rose banquet in York, PA – try to find an event near you! So I still had a few $2 bills burning in my pocket and decided I’d make a second trip to Starbuck’s. After both the wife and each took a trip to Starbuck’s this morning. It was late. Bedtime was near. So I went with something decaffeinated (passion fruit / lemonade ice tea). All in all we spend around $20 and I left $6 in tips for the worker’s themselves. 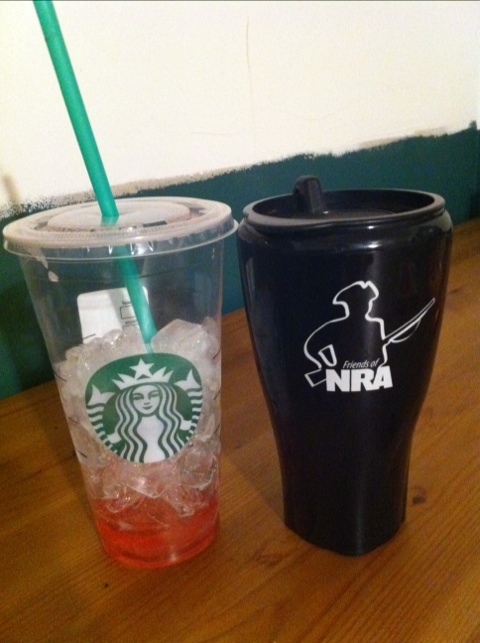 On a concerned note, I’ve seen a number of Starbucks photos with coffee and guns. Please let those have been taken on your own counter tops at home. We don’t want to be whipping our pistols out in public. Pistols should be kept holstered in public unless needed. Just a friendly reminder. Especially for those newer to the gun world who might not yet be aware of pistol etiquette. The following is the amount of funds given via grants in Eastern Pennsylvania. These funds are raised through the Friends of NRA Banquets. And distributed among a variety of organizations such as the 4H club and Boy Scouts of America. 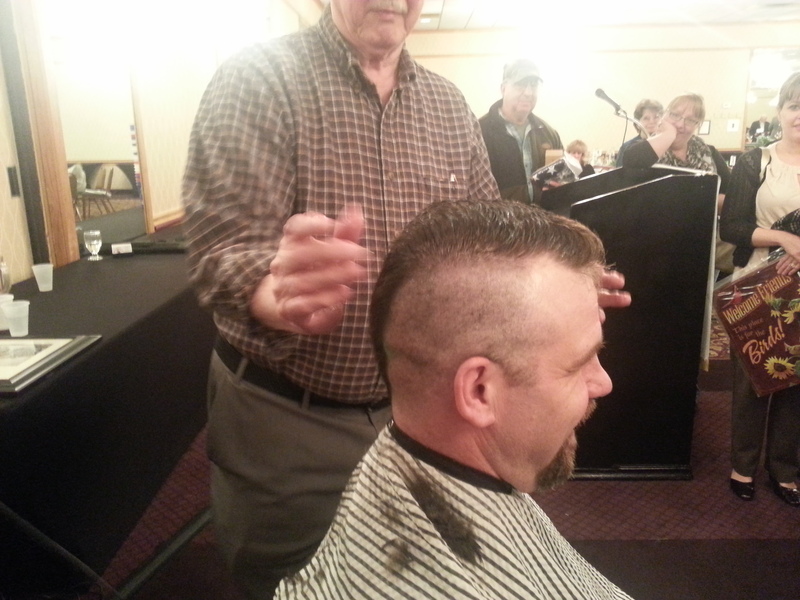 Thank you to all who participate and donate. 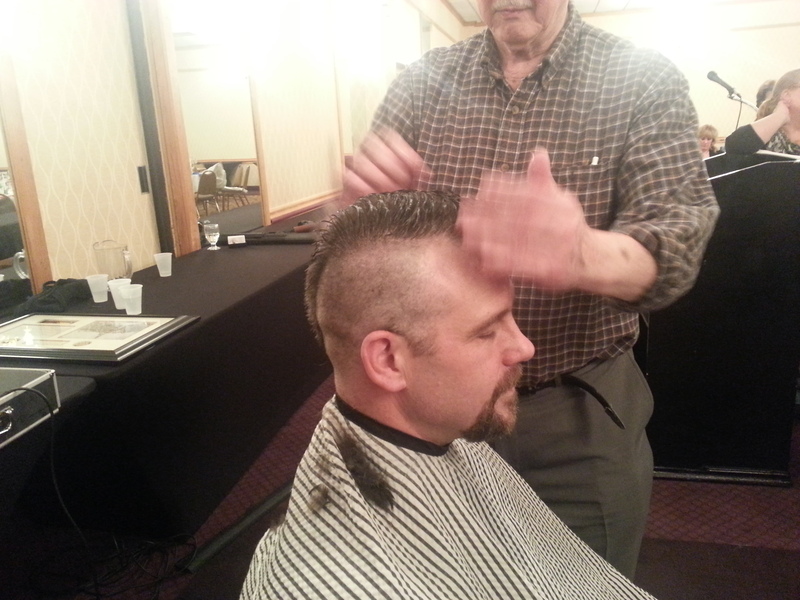 If you have never attended a Friends of NRA Banquet, I heartily encourage you to do so. You can find a list of events in Pennsylvania here or find your state here. Let me also personally invite you to the White Rose Friends of NRA (York, PA) Banquet, of which I am on the committee. It’s a great opportunity to have a fun evening out. Makes a great date night to bring someone special. Best of all, you have the opportunity to win guns and prizes. And even if you do not win, you still enjoy a great meal and good company. The above is a Savage rifle chambered in the 17 HMR caliber. For those unfamiliar with the 17 HMR, it is a .22 Magnum cartridge that has been necked down to a 17 caliber bullet. It is probably one of the most attractive and elegant looking cartridges. And I have wanted a rifle chambered in 17 HMR since first seeing the cartridges and then reading up on them. Essentially, it is a varmint round with a high velocity for a rimfire cartridge (2,000 fps – 2,500 fps). This provides the cartridge with an extremely flat trajectory. At the time I had not settled upon which rifle I wanted. 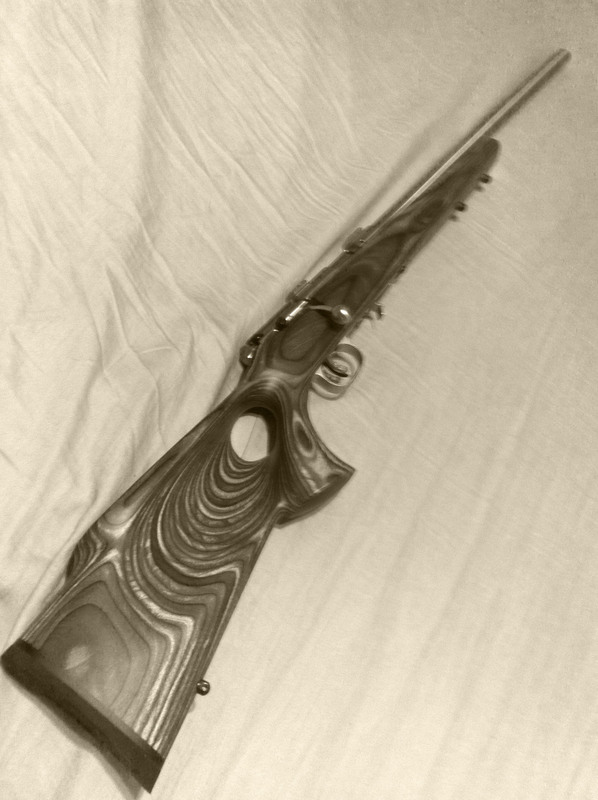 I just knew that someday, I wanted a rifle chambered in .17 HMR. Then while in Gander Mountain I saw a Savage 17 HMR rifle with a beautiful gray laminate thumbhole stock. 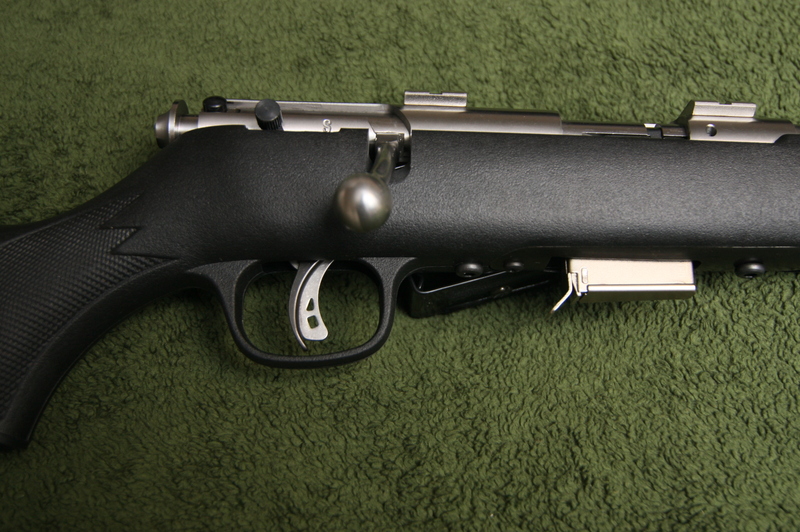 It’d look quite nice next to my Ruger Mini-14 Target (also with gray laminate stock). I then venture to find and contact the maker of the stock, Boyd’s stocks. At present they were not manufacturing these stocks, but I had my name added to a waiting list. Last month I received a call that they were available for purchase. So I placed an order with Boyd’s and placed a second order with Savage as a few parts are necessary when changing the stock. Namely, magazine plate, trigger guard (which is built into the synthetic stock), and a few screws. I decided to order direct from Savage, even though I am pretty sure I could have gotten most of the items for half the price through Brownell’s. However, I was unsure of the exact parts I needed and figured Savage would know. Well a few days ago my new stock and new parts arrived. I was so jazzed. 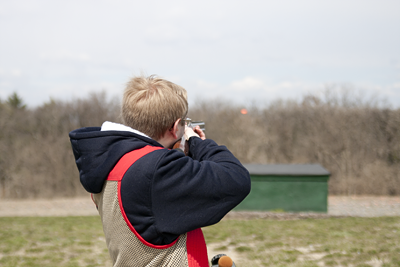 Especially as I was going out the the range with my father-in-law, and wife’s nephews. This would be the first trip to the range in about 6 months. But when I went to assemble the rifle, low and behold, the parts didn’t add up. Thankfully, Savage was nice enough to re-ship the order and handle the problem. How a company handles a mistake is very representative of the company. Mistakes happen, no company is perfect. But how what they do when a mistake is made truly makes a company great. And Savage handled the situation nicely. I did take the rifle to the range, but had to use the original synthetic stock. I purchased a $50 Centerpoint scope from Walmart as the barrel I purchased does not have any iron sights. The rifle shot quite accurately once sighted in. Recoil is about the same as my Ruger 10/22 rifle. I am quite looking forward to returning to the range with the new stock and giving the rifle another go-around. 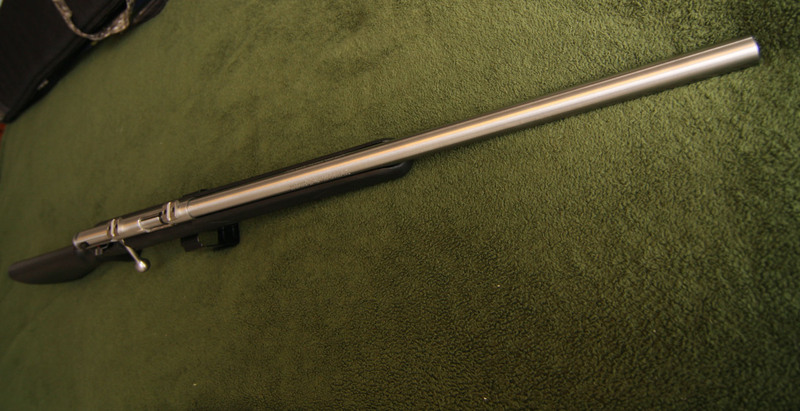 Today the replacement parts arrived and here is my Savage 17 HMR as I desired to see it.